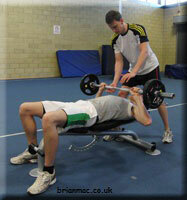 The objective of the bench press test is to evaluate an athlete's upper body strength. This test requires the athlete to complete as many bench presses as possible with no rest. 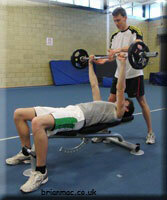 The assistant loads the bar bell with a weight close to the athlete's one repetition maximum load. The assistant uses the maximum load calculator to determine the athlete's 1RM. To evaluate your 1RM bench press enter gender, age, body weight, 1RM bench press weight and then select the 'Calculate' button. The 1RM evaluation is based on McArdle et al. (2000) reference values for 1RM bench press relative to body weight. To determine your 1RM, using the above equations, enter the weight you lifted, the number of repetitions you completed before failure and then select the "Calculate" button. The number of repetitions before failure must lie in the range of 4 to 10 repetitions and the weight greater than 10 otherwise the calculated 1RM will be zero. A good 1RM for the bench press is 1.25 × "Body Weight" for men and 0.8 × "Body Weight" for women. Analysis of the test result is by comparing it with the athlete's previous results for this test. It is expected that, with appropriate training between each test, the analysis would indicate an improvement in the athlete's upper body strength.